A Japanese space probe launched last year passed by Earth on Thursday to harness the planet's gravitational pull to propel it toward a far away asteroid in its quest to study the origin of the solar system, authorities said. 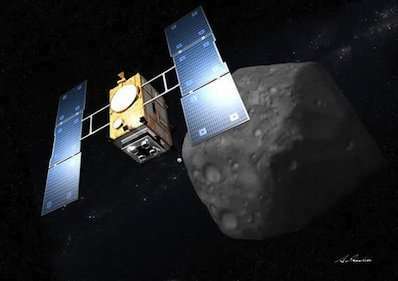 The explorer, named "Hayabusa 2", conducted an "Earth swing-by" and came as close as 3,090 kilometres (2,000 miles) above ground after 7 pm (1000 GMT), before switching its orbit to continue toward tiny Ryugu asteroid, according to simulation data made available on a website managed by Japan Aerospace Exploration Agency (JAXA). 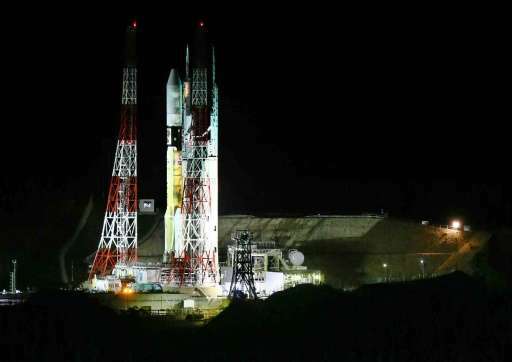 The space agency will now spend about a week analysing whether the probe has gone into the correct orbit, according to local media, including the Mainichi Shimbun daily. Analysing the extra-terrestrial materials could help shed light on the birth of the solar system 4.6 billion years ago and offer clues about what gave rise to life on Earth, scientists have said. The probe is the successor to JAXA's first asteroid explorer, Hayabusa—the Japanese term for falcon—which returned to Earth in 2010 with dust samples after a seven-year mission. The Ryugu asteroid, which is around a kilometre (half a mile) across, is believed to contain significantly more organic matter and water than the potato-shaped rock studied by the original Hayabusa.